Bhopal, February 19: More than a year after six farmers were shot by Madhya Pradesh police in Mandsaur, newly formed Congress government in the state has claimed that no one has been given a clean chit in the investigation. 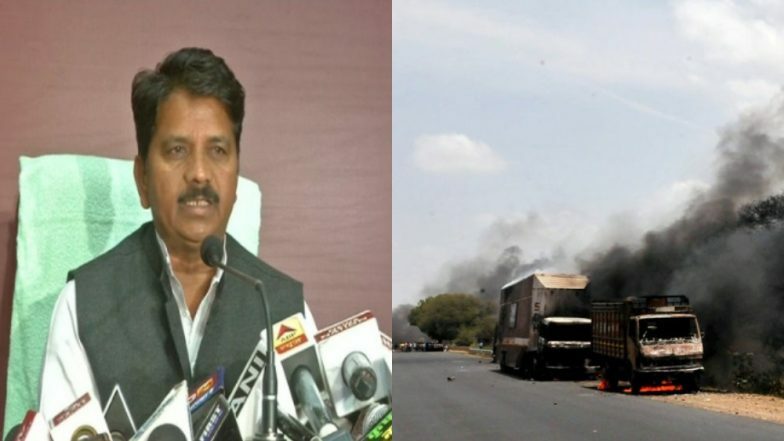 State Home Minister Bala Bachchan said that their government is looking into the aspect of the filed report and action will be taken against whoever is found guilty. Expressing his opinion on the investigation of the Mandsaur firing on farmers, Bachchan said, “We're analysing report on the incident in Mandsaur where farmers were fired at. If we aren't satisfied we'll order another high level investigation. Action will be taken against whoever is found guilty. Nobody has been given a clean chit.” Shivraj Singh Chouhan Warns Congress Govt in MP of Protests, Demands CBI Inquiry in Killing of BJP Leaders in Mandsaur, Barwani. Earlier, during the Assembly elections in Madhya Pradesh in November 2018, the issue of farmers’ killing in Mandsaur became the point of debate, as they were protesting against the agrarian distress and wanted the implementation of MS Swaminathan Committee in July 2017. During the protest, which went violent, police opened fire and six farmers were killed. Soon after the incident, the then state Chief Minister – Shivraj Singh Chauhan – had initiated an enquiry committee to probe the killing and had said that no one would be spared. Chauhan had also announced a compensation for the kin of the farmers killed in the firing.